I’m all for reducing total revenues to government, dramatically reducing tax rates and eliminating all tax preferences, tariffs, and subsidies. However, focusing only on the corporate rate is a mistake. It will eliminate the possibility of getting rid of taxes on investment. It may push up rates on individuals, particularly those who will game the system by reducing their salaries in favor of the lower corporate rates. We need a lower flat rate and the elimination of all wealth taxes. 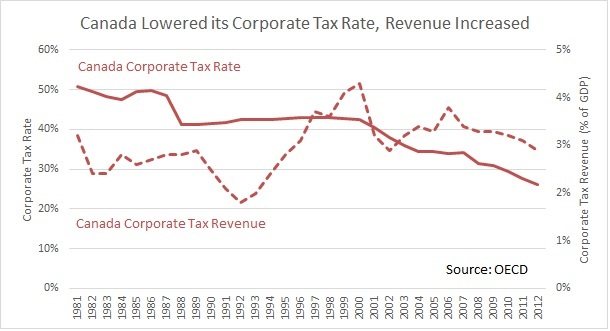 Lowering the corporate tax rate would be a huge shot in the arm for the American economy. Unfortunately some politicians refuse to believe the historical evidence that lowering rates will produce more growth and therefore more tax revenue. I’m waiting to see what happens.